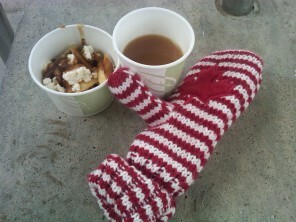 Stars & Stripes & the Maple Leaf! Here’s a great story. We have a client who loves American politics. Over the past year or so, we have framed several things related to american politics: presidential campaign bumper stickers; a Reception ticket for then Senator John F. Kennedy; a 45 album of “High Hopes” (Kennedy’s 1960 Presidential Campaign song, sung by Frank Sinatra); a display of tickets to the 1960 Democratic Convention….. This past January our client, accompanied by a couple of friends, went to Washington to witness President Obama’s 2013 Inauguration. When planning for the trip, he dropped the Canadian Embassy a line, saying that they were going down and hoping that they could have permission to be out front during the day. He never heard back from them. One friend took up the matter and contacted MP John Baird‘s office. 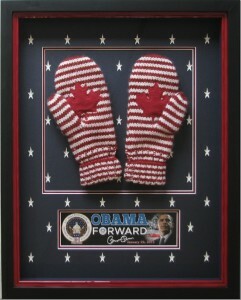 They, in turn, responded by giving them tickets to the Canadian Embassy’s “Tailgate Party“, an event that gave them access to the Canadian Embassy in Washington for the inauguration, drinks and treats Canadian-style, a great vantage point to view the parade….and a swag bag containing, amoung other things, a new version of Canada’s Olympic mittens complete with a red maple leaf on the palm. 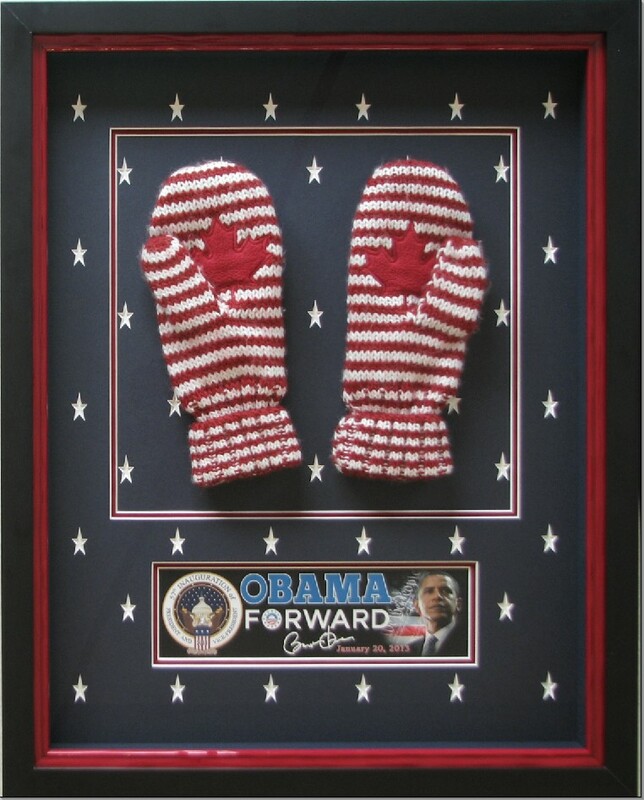 Everyone was instructed to put on their mittens and wave at the President when he went by…. it must have been quite a sight ! Needless to say, they had a great trip and were part of quite a momentous occasion. 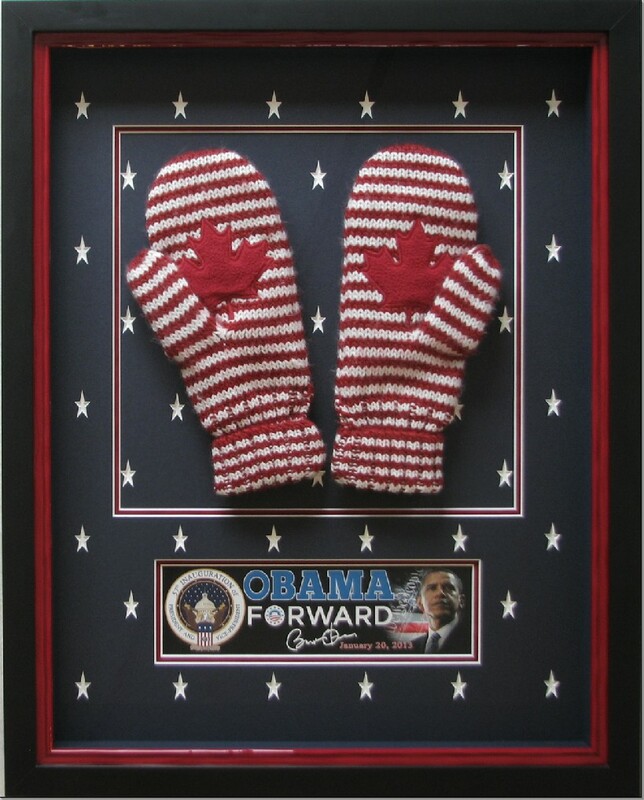 To commemorate it, our client and one of his friends brought in their mittens and a presidential bumper sticker to us for framing. 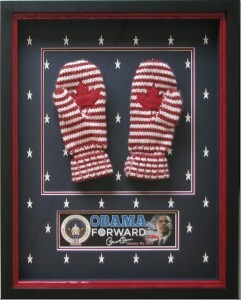 I hand-sewed the mittens onto the fall-out from the mat, mounted the “Obama Forward” bumper sticker and shadowboxed the matpack into a double stack frame with a juicy red Roma moulding inside of Larson Juhl‘s deep black shadowbox moulding.